Scotch thistle, you can prepare and eat this as you would a globe artichoke, I haven't tried it yet...ouch! It's the buzzword of the food world. Foraging refers to the gathering of wild grown food, rather than raising and harvesting it. It enables new and intense flavours to find their way onto our plates, and forgotten foods to be rediscovered. Traditional Tasmanian foods give us a window into our history, help to humanise Tasmania's past. Wonderful weeds, prepared artfully to reveal their innate deliciousness, and to allow us to enjoy their nutritional benefits, are fabulous foraged foods. But it can be fraught with danger (poisoning, jackjumpers and prickles) and controversy (pillaging from nature and letting 'weeds' stand so that we can harvest them). Correct identification is obviously important if you don't really want things like hemlock on your plate. And please note that this information is only intended as a guide and I would ask you to excercise caution and common sense when sampling any wild harvested food. Where you gather is really important. I once worked in a shop in North Hobart where a weekly job for me was washing the front window sill of the building. A film of black grime from car exhausts would build up in a matter of days on the building, and would do the same on food plants, and it's not something I'd want to eat. So choose low traffic areas to forage and wash your harvest well. The next safety considerations are sprays and storm water. There is a gutter near Margate that looks like a cornucopia for the forager. Nasturtium, watercress, fennel and three cornered garlic all abound. But I wouldn't eat any of it! I've seen the council spray the roadside 'weeds' there, and their use of chemicals is far from delicate. And then there's the storm water. Car wash detergents, lawn 'food', herbicides, re-used grey water, run-off from old septic systems and oil washed from the road surface may all find their way into this ditch, plants take up this water to grow, and perhaps absorb some of this cocktail. Now it's hard to feel hungry, isn't it! So despite the lush watercress calling me every time I come home from the school run, I leave it behind. One of our most often used foraged foods here is fennel seed. We collect this in Autumn from a quiet roadside while the seeds are still slightly green. We then wash the whole seed heads and dry them on newspaper by the fire, but the thing to be careful of in this case, is the fact that you're dealing with a weedy plant. Last year I winnowed the dried seed outside and now there are little fennel plants coming up in the garden from spilled seed. So when working with plants that have the potential to run amok, try to treat all of the plant material you are moving about with care. Don't take collecting gear with the seed of a weedy plant into an area free of infestation. But when we make our lamb and tomato curry in the Winter, fragrant with a generous dose of fennel seed, it feels well worth the effort involved. And the alternative is to buy packaged fennel seed that has travelled goodness knows how far, been stored for an unknown amount of time and grown with agricultural practices that are of unknown environmental standards. So we'll keep foraging ours and enjoying wonderful aniseed scented hands and beautiful bowls of seed heads by the fire. Pretty much every day at the moment a weed is finding it's way into my lunch. Plantain, chickweed, fat hen, shepherds purse and all manner of self sown green things. We also enjoy scavenged loquats, nettles, damsons, elderflowers and berries, rose hips, apples and blackberries and this year I'm going to see what I can do with hawthorn berries. The other foraged foods we enjoy are the Tasmanian native ones. Here I must state that the taking or harm of native plants in reserves is illegal. Collecting on private property, if not a threatened species, and if done with sensitivity, should be okay. And again, making sure the plant you are eating an edible plant is your responsibility. Correct identification is important. Bring a sprig of any native plants you want identified to me at the Tas Farm Gate, or to my friends at Plants of Tasmania Nursery. And the first time you try something, do so in moderation. For thousands of years Tasmanians have found sustenance, medicine and foods for trade among our native flora. There are many tasty and nutritious foods for those who seek them. But when harvesting we have to balance our curiosity with the good of the environment. There are some edible staples I would never consider eating as to gather them kills the plant. These include hearts of the grasstree and treefern, and the tubers of many orchids and lilies. Also there is the spread of plant diseases like Phytophthora. If you find yourself lured off of a track in an infected area you can spread this terrible fungus on your shoes. Others are an important food source for native creatures. I was looking for Native Cranberries yesterday and noticed that there weren't many berries, but there were plenty of naked seeds and little scats, so something had been there before me, something that didn't have a pantry like mine to turn to when the berries were all gone!! So please gather lightly. But I did love it when my littlest garden fairy asked for some in her lunchbox 'They're so little and sweet'! she says. Others are plentiful and well worth sampling while you are on a ramble. For a cup of tea on the East Coast, a sprig of Sweet Kunzea, Kunzea ambigua, is hard to go past. A few leaves of this will also scent a flathead fillet beautifully. Or, when we are in the high country, a teensy sprig of Alpine Baeckea, Baeckea gunniana, produces a wonderfully fragrant cuppa. Lomandra longifolia, Sagg. An important, often falsely maligned plant. This will provide shelter for wrens and bandicoots and their friends, improve lambing percentages and create habitat for ants that will help control pasture pests like cockchafer grubs. And you can eat it! So put away the mattock, leave it be and have a cold beer instead! Leaf bases of grassy plants are another good hiking nibble. Sagg, Lomandra longifolia, often has quite tasty leaf bases, a little reminiscent of peas and I have a friend who is partial to a nibble on Button Grass, Gymnoschoenus sphaerocephalus, leaf bases. Some species of leek lillies, Bulbine spp, have edible stems, there is someone making savoury shortbread flavoured with them, and some council workers once told of snacking on the unripe seed pods of Bulbine glauca. Perhaps the most important of these from a survival perspective are the tubers. I have written before of the murnong, but there are dozens of others. Potato orchids, chocolate and vanilla lillies, water ribbons, but they all share the same problem, harvest them from the wild and you kill the plant. The only really ethical way to sample these is to grow your own. Mudflats on tidal estuaries are another source of wild edible plants. Samphire, Sarcicornoa spp, Seablight, Suaedea australis, and sometimes Sea Celery, Apium prostratum, are all found there. but these are also sensitive areas. The wonderfully disguised nests of waterbirds are built above the tide line and it would be possible to trample entire families without even noticing. So again, please be delicate. Stick to paths and watch your step. Some of the most obvious and tasty 'bush foods' are the berries. Have a look at David's blog for a wonderful exploration of some of these. Astroloma humifusum, Native Cranberry. Nothing like a cranberry, but a sweet bush treat! Billardiera scandens Apple berry, one of my favourite flowers. When bletted like a medlar this has a sweet appley-raisiny flesh with plenty of seeds! There are also the challenging ones like the Kangaroo Apple, Solanum laciniatum. This plant is related to tomatoes, potatoes and nightshade. An extract from it has been used as a contraceptive in Russia and the berries are reported to be toxic until ripe. So I've yet to give this one a good try, but this Summer I will. The first Tasmanians learnt to collect the near-ripe fruit and bury it in dry sand to ripen away from hungry wildlife. When ripe it is safe to eat, so this year if you come here for a Autumn barbie, expect a jar of Kangaroo Apple relish to be on the table. This is a fast growing, hardy, pretty garden plant, and if it proves tasty it would be a prolific source of home grown bush tucker. But if the birds get to it there will be kangaroo apples coming up all around your neighbourhood. This is surely a plant that is worth finding a local native seed source for, to prevent mixing up geographic adaptations. One of my life's most memorable meals is a posh-meets-bush affair. We visited a winery on a trek up the East Coast for a nice bottle of white, gathered some lovely mussels, and put the two together in a hot pan with a tiny bit of butter and garlic.When the mussels had opened we added a liberal sprinkling of sea celery, an native parsley-like plant that is delicious at first taste. Right now I am growing a few selections of sea celery, from Coles Bay, Margate and South Bruny. At this stage I think the Coles Bay one has the best flavour, and I have 30 tiny seedlings that should be ready be for sale at Tas Farm Gate market in late January. 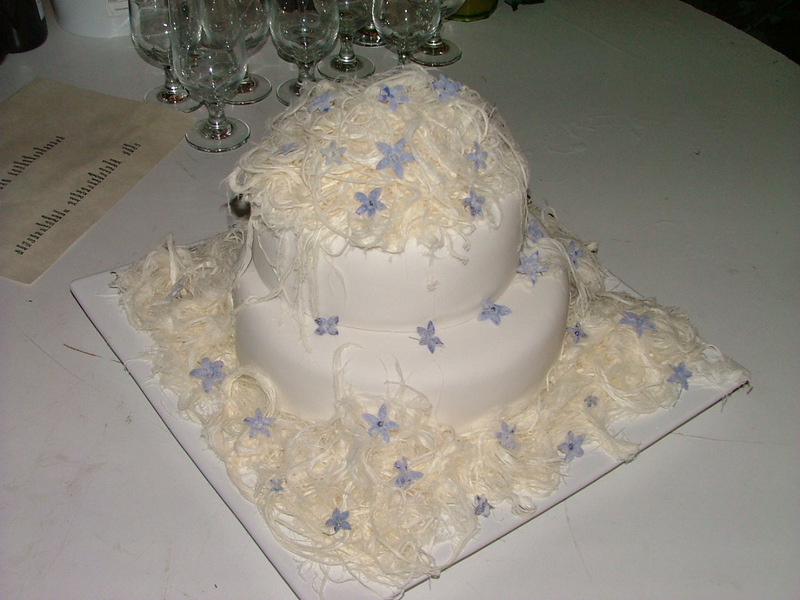 And I won't be forgiven writing a piece on foraged foods without mentioning my most romantic piece of bush tucker, our wedding cake. A friend made us a wonderful confection of halva and hazelnuts which we then crowned with a cloud of Persian fairyfloss, and into that cloud we nestled some sugared native bluebells that I'd gathered and frosted a few at a time for months leading up to to big day. Ever so pretty, and there weren't any leftovers! Our Wahlenbergia garnished wedding cake. Not the best picture, and the drizzle that provided atmosphere for our big day wilted the Persian fairy floss somewhat, but you get the idea! This is a subject close to my heart. As a youngster I remember poring over bush tucker books from the library and being frustrated that much of it referred to Northern Australian plants. But there are now many people working to redress that imbalance. So read, learn, nibble and enjoy! And I've hardly skimmed the surface here, so expect more 'foraging' stories soon....And if you've made it this far down the page, please let us know what you think, and if there are any favourite foraged treasures that your family enjoy please share with us! We'll be at Tas Farm Gate on Sunday the 9th and 23rd of January. Hope to see you there!